There are many reasons you may want to choose the best paint sprayer for trim. Whether you are a handyman or a homeowner, paint sprayer (for trim) is an important tool that you can add to your arsenal of tools. If you have any kind of paint project, you know that having a paint sprayer can add efficiency to your work. There are many things to look at when choosing the best paint sprayer for trim. Just because a paint sprayer is not designed specifically for trim doesn’t mean you can’t buy it for your trim work. All you need is to understand the features, functions, and capability of the paint sprayer. If you are going to be moving from location to another while working, you need to consider portable paint sprayers. Fortunately, most of the paint sprayers we recommend are lightweight. Another thing is to consider the quietness of the paint sprayer. Some of the complains that prop up from users is based on the noise level of the machine. If you are not patient with a loud machine while you work, you want to read other reviews before taking a plunge so that you know you are buying something that will give you complete value for your money. Also, ensure the paint sprayer is well built and very durable. Proper maintenance is very important if you want to enjoy your device for a long time. It is recommended that you clean the sprayer immediately after each use to prevent rust and keep it from clogging the next time you use it. Not doing that can make the tip rust quickly and that might necessitate replacement which is not a nice thing to have after spending so much on a machine. In the following paragraphs, I have listed the best paint sprayers for trim with their features, advantages, as well as the disadvantages. This Graco Magnum X5 is considered the best paint sprayer for interior trim. While Wagners are suggested for beginning painters or more casual painters, the Graco brand is recommended for people who want higher quality results. To put things into perspective, professional painters typically buy from Graco rather than Wagner. Of course, higher quality generally means more expensive. 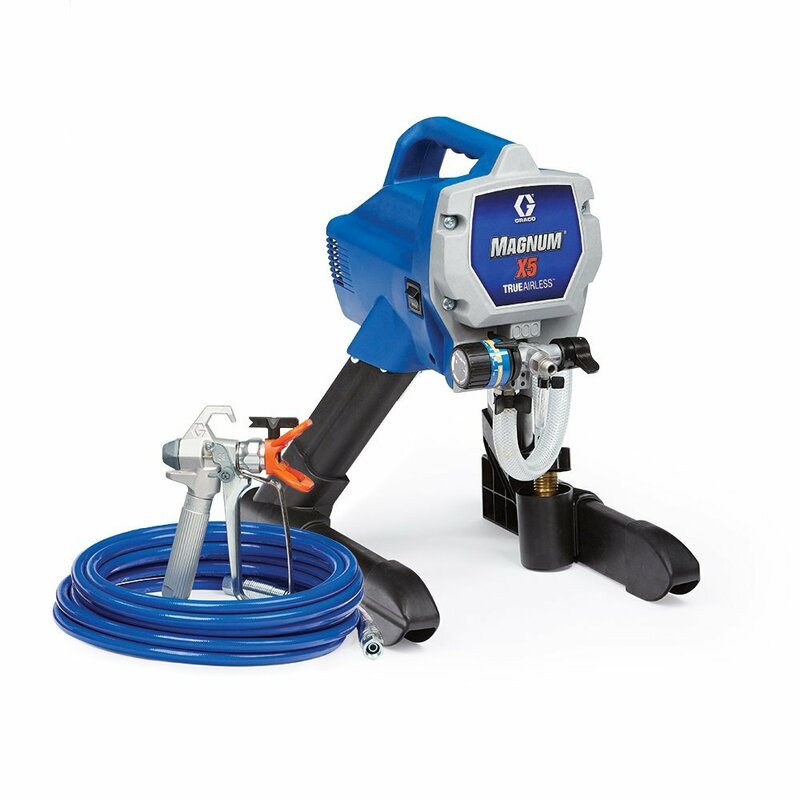 The Graco Magnum X5 (262800) Airless Paint Sprayer is designed for homeowners who want to get professional results. It has a slight learning curve, but once you do learn how to use it, you’ll be seeing new, smooth paint job. Before you know it, you’ll have one beautiful looking house. This paint sprayer is an airless paint sprayer, which is the best possible way to do large jobs. Airless paint sprayers can help paint projects up to 10x faster. There are several other aspects, which make it such a convenient tool for large projects. This paint sprayer can spray at a max rate of 0.24 GPM (gallons per minute). In other words, in a mere 4 minutes, you could basically use up a whole gallon. This rate should not too fast for beginners to handle. Some paint sprayers have a rate of 4 GPM. Higher GPM is necessary for quicker results, but remember that sometimes, you don’t want to rush your projects. The pressure of 2800 PSI (pounds per square inch) is also perfect for large projects like houses, planes, bricks, pools, etc. However, if you are planning on only doing small projects (like a fence or door), then getting this high of a PSI is usually unnecessary. The 25 FT hose allows for enough freedom of movement without impeding the process. This is (once again) long enough for most big projects like painting a house. It actually also has a max length of 75 FT, but I think that this is a bit unnecessary. With that said, you can see how this Graco Magnum X5 can be a great option for those that want to do large projects. It comes with a spray gun with an adjustable tip so that the painter can get his ideal size. It’s also capable of spraying anything from latex to stains. The lack of problems with this model makes this a short, simple review. One complaint is that the instruction manual is confusing so there is a bit of a learning curve. The good news is that it also comes with a DVD instructional video that explains everything perfectly. It’s so easy to understand that you’ll get started in no time. One customer had a problem with the tip of the spray gun. However, this person also bought it used from a 3rd party rather than from Graco themselves. In other words, you should not have this problem as long as you buy it new or from Graco. They are known to have great customer support. This paint sprayer is an amazing product. Whether it’s used or not, almost everyone praises it as doing a clean, professional job. People were actually surprised at how quickly they finished their projects with no overspraying issue. The cleanup is always a hassle, but with this sprayer, most people found that things were less messy. In other words, cleaning up took less time and was much easier. One tip is to always test it out before using it. All paint sprayers are different so it’s necessary to get the feel of it before you start. There is also a learning curve, especially because the manual is so hard to understand. However, if you just watch the instructional DVD instead, then you will have no problem using the Graco Magnum X5. The paint job will come out smoothly. Overall, this airless paint sprayer is a bargain at this price because of several reasons. The paint job is smooth and clean. I’d suggest that you only buy it for larger projects though as this much power is usually not necessary for a simple job like painting a door. So, if you are looking for the best paint sprayer for interior trim, then this is a good option. As I stated before, the Wagner paint sprayers are very popular. However, just because they are popular does not mean that they are the right for you. Each model has specific qualities. The Wagner 0515077 ProCoat V2 Paint Sprayer is intended for bigger projects than the Wagner 518080 Control Spray Max HVLP Sprayer. Airless spray painters are the ideal method for doing large jobs. Add to that the larger tank and incredible speed and you got yourself a great paint sprayer. If you’re planning on doing a large project (like painting a house), then you will want to read this. This model is directly connected to a gallon of paint with a 25 FT airless spray hose. The 25 FT airless hose is big enough to do projects without having to constantly stop or readjust so that’s definitely great. This model can also be connected to either a 1-gallon or 5-gallon tank, which allows the painter to do large jobs quickly (like painting the house). If you were using cups or other small tanks, then you would need to refill constantly, which is a waste of time. The 2800 PSI (pounds per square inch) pressure also is ideal for houses or pools (aka large projects). A lower PSI is weaker and as such, lower PSI models are better for smaller projects. In addition to this, as I stated before, airless paint sprayers (like this one) are the most efficient and ideal ways to do large jobs. Basically, this model was built to do big projects. The spray gun is light and easy to use with a tip size that ranges from 0.009″ to 0.015″. In addition to this, you can control the pressure of the spray gun to help avoid overspray. Also, the reversible spray tip allows you to clear out any clogging of the paint, which can be pretty handy. All these features allow for an easy-to-use paint sprayer for big projects. To further emphasize its user-friendliness, this paint sprayer is very easy to assemble and setup. Overall, this model is a good choice for beginners who want to do a big project like painting a house. Reviewers agree on one thing – this model gets the job done. In just a few hours, you will have painted an entire pool, house, or fence. It makes painting much faster and easier, and you know what they say. Time is money. Nevertheless, there was one complaint. This unit kept losing its prime, which meant that the pressure was lost. He had to wait until it regained pressure to use the paint sprayer again. It seems that with solid colors, this model might have problems, especially since it can cause uneven distribution of paint. One advice is to dilute the paint. If you do not want to dilute the paint, you might want to check out other models like this Graco Magnum X5. The Wagner 0515077 ProCoat V2 Paint Sprayer is a great solution for beginners or homeowners who want to paint their houses themselves (or any other equally large projects). With its huge 5-gallon tank and easy-to-assemble parts, you’ll be done with everything in no time. Setting it up and painting that fence or house will be done in just a few hours. Since airless sprayers are also the most efficient method to doing large projects, you will definitely be satisfied with this model. In addition, the spray gun is light and easy to use. The pressure adjusting feature also allows you to get the ideal look to help fight that overspraying problem. Unfortunately, there is one issue. This model’s prime may have problems with solid stain colors. A loss in the prime can cause uneven distribution of paint. You can either dilute the paint to help the problem though. Overall, this model is a great option, especially at its price. You will be getting high-quality results. As always, I love Amazon for its cheap prices and reliability. This another impressive airless paint sprayer for painting trim. This Wagner Power Tex Sprayer is considered the best paint sprayer for doors and trim. Wagner usually gets much more negative criticism than necessary. You generally get what you pay for, and Wagner paint sprayers are usually much cheaper. That’s why these products are for casual painters. If you want professional work, you should be looking to buy professional products. Despite this, the Wagner Spray Tech got surprisingly good reviews so I had to try it out for myself. It’s not bad. I don’t think I’d recommend it over a few other models. In any case, you can still use it well. Just practice and follow my advice. Otherwise, you’re going to hate it. The Wagner Spray Tech 520000 Power Tex Texture Sprayer is highly convenient because you do not need to lug around air hoses or anything of the sort. It loses some of that power, but in return, you get convenience. Despite this, it’s still pretty heavy, especially when it’s full of mud. If you plan on doing an entire room, because of its weight, you will get a free workout. That might be a positive quality if you think about it. You can even reach ceiling if you wanted to, but it should be used for smaller projects like a cabinet. Assembly is as simple as it gets so it’s great for people who aren’t used to doing home improvement work. This model comes with three different-sized nozzles (large, medium, small) to help control the texture. This isn’t ideal, but it can work. With the “variable-flow trigger”, you can achieve three different textures. Always try them out before applying to see what they look like. Depending on the nozzle and variable-flow trigger, you can get widely different results. This model does not have the same output as other compressor units. That’s to be expected since it sacrificed power for convenience. However, at the same time, that means you cannot use this for big projects unless you’re willing to spend a really long time. As a result, the Wagner Spray Tech 520000 Power Tex Texture Sprayer is only recommended for quick and small projects. Unlike the other Wagner models, you cannot adjust pressure. In other words, there is a higher chance of overspraying. To alleviate this problem, you do get three different-sized nozzles, but as stated previously, this solution isn’t really ideal. It can get messy with the paint oozing out of the nozzle and onto the trigger. It’s good to stop once in a while to clean out the nozzle. Otherwise, the dried mud will accumulate and hinder the process in the long run. Another thing to note is that you must use very thin mud. Not following this golden rule will lead to a lot of trouble with this sprayer. It’s loud. Get earplugs. You have been warned. The texture is not completely smooth, but at the same time, you can’t expect professional results from a $$ product. At these prices, you are getting products that simply do the job. Finally, practice before you start using it. Each sprayer is different so you have to “re-learn” how to use a new sprayer by practicing. Overall, this paint sprayer is decent, but I wouldn’t say it’s that great. It gets messy. It’s loud. You have to use really thin mud, and it’s heavy. On the other hand, the results aren’t bad. You don’t need to lug around an air hose, and it’s compact so that you can store it away easily. The Wagner Spray Tech is something I’d recommend if you want a quick paint job done. Otherwise, I’d stick to something else. If you do want to buy it, always go to Amazon. 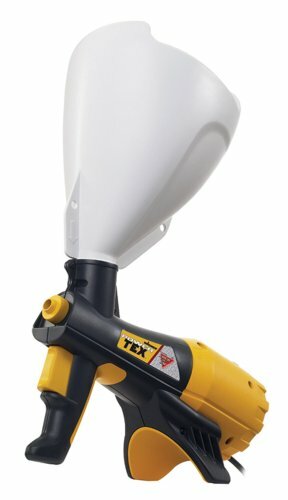 So, if you are looking for the best paint sprayer for doors and trim, try out the Wagner Power Tex. This is considered the best paint sprayer for cabinets and trim. Sometimes, getting a good paint sprayer just does not cut it. 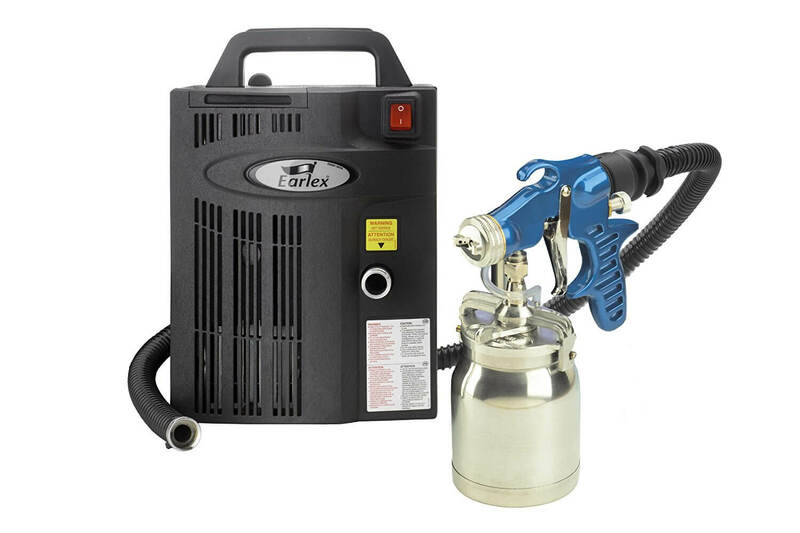 The Earlex HV6900 is a good paint sprayer by itself. But, I would not buy this when there is the great Fuji Mini-Mite 4 out on the market for a comparable price with more features. In this review, you will see a lot of comparisons to the Fuji Mini-Mite 3. This is a good paint sprayer on its own so you may still want to read this review. It’s just not great. So check it out if you want to compare. This paint sprayer uses a 3-stage turbine. For people that do not know, the 3-stage turbine is typically found in more expensive models and is much stronger than a 2-stage turbine. The greater pressure vaporizes the paint into tiny particles so that you get a much more refined finish. It’s necessary for those that want perfect results. Because of this, this HVLP paint sprayer will not have any problems with thick or thin paints. It is designed to handle both oil-based and water-based products. It comes with a 2 mm tip, which unfortunately is not adjustable. As a result, you cannot adjust the tip for specialized projects. However, the results are still good since you can adjust the fan width. If you are looking for a paint sprayer that allows you to adjust the tip as you would like, you should check out the Fuji Mini-Mite 4. This paint sprayer allows for three different spray patterns (vertical, horizontal, circular) at the push of a button. It’s always important to have full control over your paint sprayer. You can easily adjust the pattern to fit whatever project you need to do at the moment. However, you cannot adjust the size of the patterns. Finally, this paint sprayer features a 13 FT hose. A 25-foot hose is pretty standard these days. I guess for an extremely basic project, 13 feet is enough, but it can be a hassle. Unlike the Fuji Mini-Mite 4, the grip of this spray gun is uncomfortable. The developers probably did not think much about the design of the spray gun, but it is actually extremely important. For example, after spraying with the Earlex HVLP paint sprayer, you might get tired or your arms might get sore after a measly 20 minutes, especially because the air tube gets in the way. With a comfortable grip though, you can be painting for an hour before taking a break. Also, unlike the Fuji Mini-Mite 3, you do not have an air control valve. This is important because it allows you to control the amount of air being emitted. As I said in the Fuji Mini-Mite 4 review, this allows you to minimize overspray. You would use lower the power when doing a smaller project like window panes, but you would need to increase it when doing something bigger like a door. Actually, on the Mini-Mite 3, you can also control the size of the pattern. Overall, it just has many more options. Although the hose is pretty strong, it is just not as durable as your typical rubber hose. You can buy a stronger, more durable (and longer) hose separately. Overall though, I wouldn’t recommend getting it since the original hose is durable enough for most people. It will only pose to be a problem if painting is your job. Some people have complained about the loudness of this paint sprayer. This one is particularly loud, but please note that nearly all paint sprayers with a stage turbine will be loud. It’s always good to have earplugs ready. This gun is a bleeder type paint sprayer as opposed to the similar-priced Fuji Mini-Mite 4 Spray System. Bleeder types always have air coming out so this may cause undesired results (like dust to be blown onto the project). Overall, I think that the Earlex HV6900 is not worth the price. The Fuji Mini-Mite 4 for a comparable price has more features with a more comfortable gun and a more durable hose. As a result, I would recommend looking at my Fuji Mini-Mite 4 review. However, the Earlex HV6900 is a bit cheaper. If you’re on a budget, this paint sprayer is still good. It’s just not great. The Campbell Hausfeld HV3500 65 CFM Fine Finish HVLP Paint Sprayer isn’t something to go crazy about, but it’s not bad either. 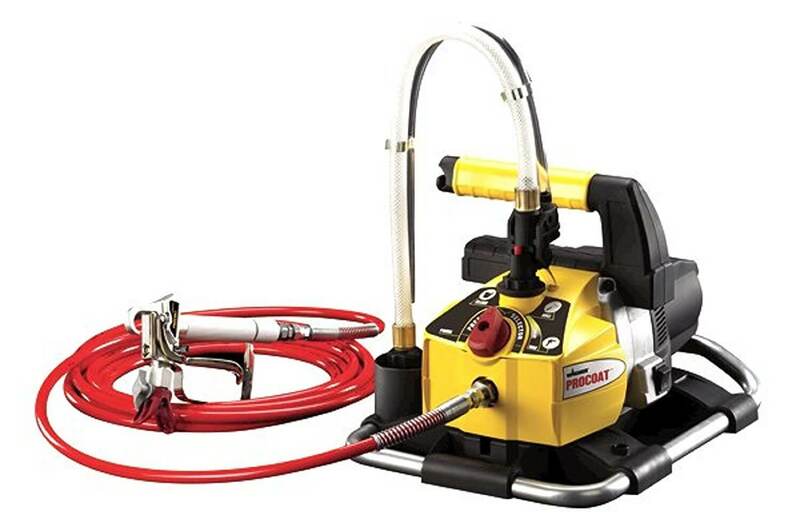 This HVLP paint sprayer is smack dab in the middle when it comes to quality for its price. In other words, the Campbell Hausfeld HV3500 is not a steal, but you’ll be satisfied with it. It does a good job with some minor weaknesses that can be avoided depending on the type of paint you have and the goal of your project. I will break down the pros and cons while also giving suggestions for who it’s for. To start things off, the first thing to note is the 2-stage turbine. Remember that more turbine generally means more power, which results in a higher cost. The Campbell Hausfeld HV3500 only has a 2-stage turbine, which is about average for the normal homeowner. However, this model has slightly more power than your average 2-stage turbine. The 5 PSI (pounds per square inch) is equal to the more expensive Earlex HV6900 and the 58 CFM (cubic feet per minute) is higher than the average 2-stage turbine so in that sense, this paint sprayer is relatively powerful. You just flip a switch to turn it off or on. Each turbine has an air filter to make cleaning easier. You just take it out every once in a while to clean and put it back on. This model comes with a long and durable 25-foot hose, which is longer than the average 2-stage turbine paint sprayer. Longer is better because you can go painting for longer sessions without being restricted by a short hose. In addition, the Campbell Hausfeld comes with 2 needles (fine and medium) to do different projects. The fine needle works great for waterbased finishes while the medium needle, in theory, works great for thicker paints. The spray gun can be assembled using the wrench that also comes with this package. Finally, you get a nice little cleaning brush. This doesn’t sound too bad so far. Overall, this paint sprayer is designed to do smaller projects for a more refined finish. Think of cabinets or furniture. Some people even paint their fences, but generally, you would want to use it for smaller projects. It has a 2-stage turbine, which is designed for small projects. After all, there’s no point in getting that extra power if you aren’t going to be using it. It’s also an HVLP paint sprayer. Unlike airless paint sprayers, the HVLP paint sprayers are not designed to do big painting jobs. But, the greatest part about this paint sprayer is that it’s so easy to use. All beginners rave on about how quickly they got started with this. Now, despite these attributes, there are a few “problems”. First, remember that this paint sprayer does not use a 3-stage turbine. It uses a 2-stage turbine, which is alright. However, this paint sprayer is not powerful enough to paint thick paints. It’s great for water-based finishes. However, if you want to paint oil-based poly, then it will not work exceptionally well. With the medium needle, it will work better but still not great. That’s why if you plan on getting this paint sprayer, remember to get water-based and not oil-based. You’ll get a great and smooth water-based finish. The paint sprayer is so strong that you might want to do a few things before starting. First, wear goggles to avoid the fume. Second, wear earplugs because, like any HVLP paint sprayer, it will get loud. HVLP paint sprayers can be either from the bleeding type of the non-bleeding type. This is the bleeding type, which means that it constantly emits air even when you are not using the spray gun. It’s not a huge problem, but you have to take note that this will blow air even when you aren’t using it. There are portions of the spray gun that are made of aluminum so the durability of the gun is questionable. However, nobody has complained about their guns breaking down. 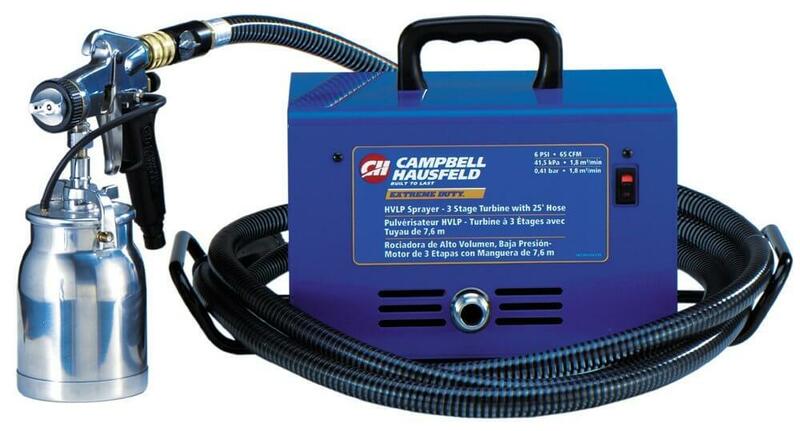 The Campbell Hausfeld HV2500 is an easy-to-use paint sprayer that performs well. It is great for the average homeowner and fairly powerful for a 2-stage turbine with various features to get a better finish. The 25-foot hose is durable and longer than your typical hose for an HVLP paint sprayer. It is easy to clean, and you won’t get much overspray so you don’t have to worry too much about cleaning. I hate cleaning, but it’s not THAT much of a hassle. Unlike other models around this price range, there is also no leaking. I mention that it’s easy to use? Still, there are a few problems. If you have oil-based paint, then you will want to look at other models. This model works extremely well with water-based paint as opposed to oil-based. If you do get thick paint, you will have to thin it down to the right viscosity, which can get a bit tricky. This paint sprayer also sprays a little faster than you would think so you will want to practice for a bit before starting. Finally, you will want to wear goggles and have ear protection because of the fume and loudness. Overall, I would get it if you have water-based paint and are confident that you can handle the slightly faster spraying speed. If not, then you should look at other models. So, if you want the best hvlp paint sprayer for painting trim, check this out. If you’re looking for an affordable method to drastically cut down the time it takes to paint, then the Wagner 9175 Airless Twin Stroke Piston Pump Paint Sprayer is the solution for you. This airless paint sprayer paints at incredibly fast speeds so it’s great for homeowners that have large projects that they regularly paint. Or a handyman looking for a powerful, fast speed paint sprayer to handle various painting tasks. Even if you don’t regularly paint, you will want to check this paint sprayer out. Because I’m sure you don’t want to spend half a month painting with a simple roller when you can finish that same project in one day. The metal spray gun is comfortable so that you can paint for long periods of time. Yes, there are paint sprayers that do not take into consideration the comfort of the spray gun. The Wagner Twin Stroke Piston Pump Paint Sprayer comes with a powerful PSI that’s adjustable from 0 up to 3000. 3000 PSI is nearly on the level of industrial work, but it’ll work well for any big projects. The Wagner Pro Force Paint Sprayer is built for doing large projects quickly. You just need to look at the specs to understand why. First, we need to look at the power of this monster. It sprays at an incredibly fast rate of 0.30 GPM (gallons per minute). To put things into perspective, if you were to paint for ten minutes straight, you would have already used 3 entire gallons of paint. That’s a lot of paint. Add to that the 3000 PSI (pounds per square inch), and you got yourself a powerful airless paint sprayer. Second, let’s look at the metrics behind this airless paint sprayer. With a 0.18″ spray tip, some beginners had trouble maintaining all that spray that the gun is pumping out. Of course, after painting for a bit, they eventually got the hang of it so my advice to you is to practice before you start. If not, you can always opt to buy a smaller spray tip. In addition to this, you will note that it comes with a 25-foot hose. This is pretty standard among airless paint sprayers, but a 25-foot hose allows you to paint without it being such a hassle. Some people actually purchase the optional 50-foot hose since they intend on painting even larger projects. If you are planning something big (maybe a big house? ), then getting the 50-foot hose might actually be the best investment you could make. However, the standard 25-foot hose is good enough in most cases. Finally, let’s look at some miscellaneous features. The Wagner Twin Stroke Piston Pump Paint Sprayer comes with a mobile cart to help carry the tools around. It’s an interesting feature, and it makes things convenient. The spray gun is all-metal except where the hand directly touches it to make it durable and yet comfortable. Overall, the Wagner Twin Stroke Piston Pump Paint Sprayer is a durable and light airless paint sprayer. It does not clog because it actually has a self-cleaning feature. It’s a great choice for homeowners because it allows you to paint quickly, efficiently, and easily. However, it also has a lot of power to it. It may pump out to much paint for the beginner. You can opt to buy a smaller spray tip or simply look at some weaker airless paint sprayers. As stated, this much power may not be the ideal choice for beginners. Most of the time, just a few minutes of practice is enough to adjust. However, it may still be too much power for others. You can always buy the smaller spray tips, but if you are afraid of being unable to adequately control the Pro Force, then I would suggest getting a weaker airless paint sprayer. Although the Wagner 9175 Airless Twin Stroke Piston Pump Paint Sprayer rarely clogs because of its self-cleaning feature, it is still a hassle to clean up. Well, cleaning up is always a hassle, but cleaning up may actually take longer than the actual painting process for first-timers. You will learn from any mistakes and adjust eventually, but be aware that cleaning can be a problem the first time (or maybe even the first few times) you use this paint sprayer. Overall, these are minor problems and are only a problem for the absolute beginner. With some practice though, you should be able to handle the power and shorten the time necessary to clean. The Wagner Piston Pump Paint Sprayer is a great solution for do-it-yourself homeowners. Its relatively easy-to-use and high power make it a popular choice for beginners. 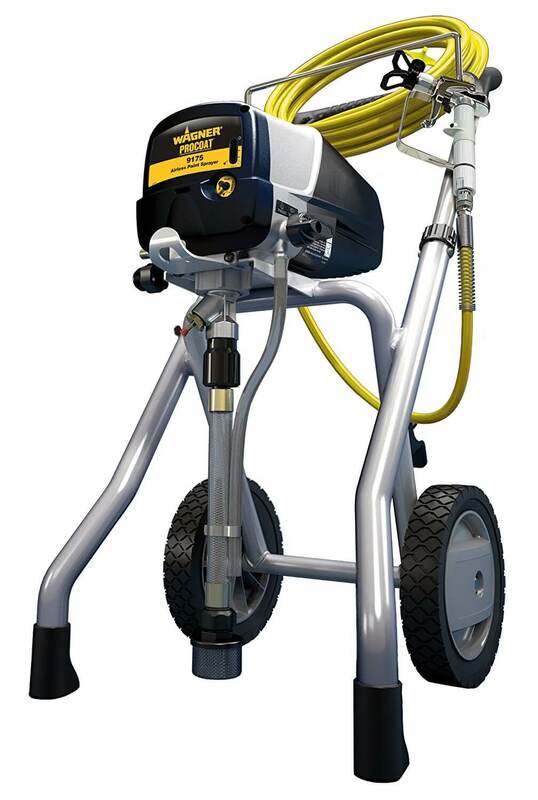 This airless paint sprayer packs a lot of power (3000 PSI + 0.30 GPM), comes with a lengthy hose (25-foot hose), and even has a cart to make things more convenient. Finally, the self-cleaning feature helps avoid clogging. Overall, it’s simply a fantastic choice for beginners who are planning to do large projects. However, a few people have struggled with the power. The Wagner Twin Stroke Paint Sprayer pumps out a lot of paint so one option is to buy a smaller spray tip. Another option is to try a weaker airless paint sprayer like the Graco Magnum X5. Most people, though, adjust rather quickly so this generally should not be a problem. And this is why we consider this to be among the best paint sprayer for painting trim. Choosing the best paint sprayer for trim can consume your time through researching, consultation, and comparison especially when you are looking at dropping a lot of cash. With a few more findings such as reading more reviews on the actual product page before buying, you can make an informed decision because you will be more knowledgeable than the average search on how to select the best paint sprayer for trim.